Southern California street scene watercolor on paper by listed California artist Lois Cohen Green, who was born in 1919 in Chicago, Illinois. 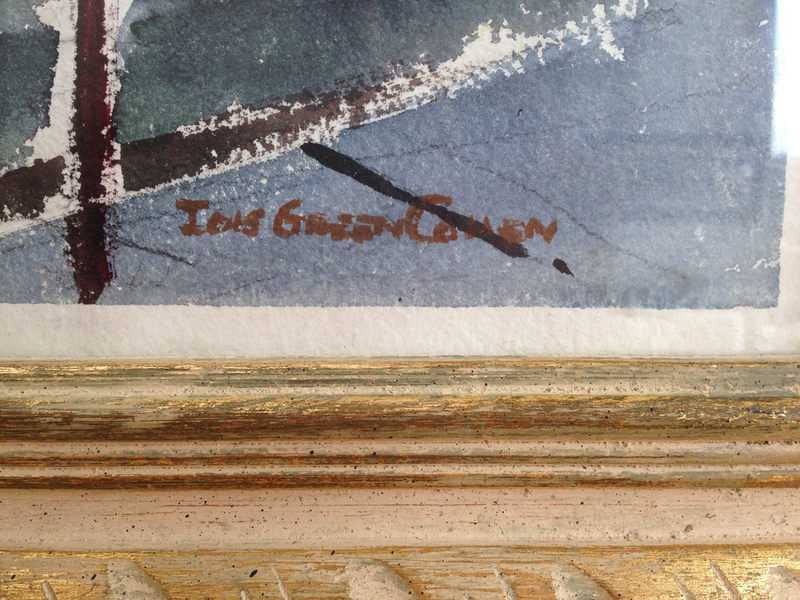 Primarily a watercolorist, Lois Green is especially known for her paintings for projection at Griffith Observatory. She was born in Chicago and studied at Carnegie Tech in Pittsburgh and with Samuel Rosenberg. She worked in Pittsburgh as a fashion illustrator before moving to Los Angeles in 1938 and then studied at the Chouinard School and at UCLA. She worked as a motion picture illustrator and painted in her spare time. In 1945, she married Eugene Cohen, and in 1973, began the Griffith Observatory project. Her subject matter includes figures, landscapes, animals, and urban scenes. She was a member of the California Watercolor Society. In 1999 she was included in an exhibition called "This Side of Eden: Images of Steinbeck's California" by the Steinbeck Center in Salinas, California. Lois Green died on February 21, 2012. This painting measures 30" long x 21" high to the inside of the frame & 38" long x 29" high to the outside of the frame. It is in excellent condition in a vintage frame.